The Memphis Southmen (aka “Grizzlies”) were not only successful on the field but also one of the few World Football League teams that was financially sound. Owned by Canadian businessman John Bassett Jr., the Southmen were coached by John McVay, formerly of the University of Dayton, and had won nine straight games as they prepared to meet the Charlotte Hornets on October 9, 1974. Rookie backup QB Danny White (pictured above) was filling in for injured veteran John Huarte for the third time, but it had not slowed the Southmen. The running game, featuring J.J. Jennings, John Harvey, and Willie Spencer was the new league’s best and WR Ed Marshall led an able group of receivers. The team they were facing was only recently relocated and renamed. As the New York Stars, coached by Babe Parilli, the club played reasonably well and had an 8-5 record. However, their home venue was the substandard Downing Stadium, and they drew poorly in competition with the NFL Giants and Jets. The franchise was sold to Upton Bell, son of former NFL Commissioner Bert Bell, and moved to Charlotte, North Carolina. As the Charlotte Stars, they defeated the Chicago Fire on the road, but were now rechristened the Hornets as they faced Memphis in the first game at their new location. There was a sellout crowd of 25,133 for the Wednesday night game at Charlotte’s Memorial Stadium, and with enthusiastic fans in attendance, the ex-Stars were clearly fired up. The teams traded fumbles in the first quarter before Memphis went 36 yards in five plays capped by J.J. Jennings scoring a one-yard touchdown. White passed to Ed Marshall to convert the action point to make it 8-0 (in the WFL, touchdowns counted as seven points and were followed by an “action point”, which could not be kicked). Charlotte safety Ike Thomas returned the ensuing kickoff 56 yards to the Memphis 33. Ten plays later, the Hornets scored on a one-yard sneak by QB Tom Sherman that was greeted by a huge ovation from the home crowd. RB Jim Ford tied the score at 8-8 by running for the action point. The exchange of first quarter touchdowns remained the only points of the first half as White struggled in the early going, completing just four of his first 11 passes. In the third quarter, Bob Etter put the Southmen back in front with a 28-yard field goal. In response, RB Don Highsmith ran for a four-yard touchdown to put the Hornets in the lead, although the action point attempt failed. Charlotte was ahead by 15-11 heading into the fourth quarter, but two minutes into the final period White threw to Marshall for a 13-yard touchdown and Memphis was back in front. White then threw to WR Roger Wallace for the action point. The lead increased when White connected with Marshall for another TD of 19 yards with 6:15 to play that gave the Southmen a 27-15 margin after John Harvey ran for the action point. The Hornets fought back, driving 61 yards and Highsmith finishing the possession off by powering across the goal line from a yard out for a touchdown. They successfully added the action point as Sherman threw to WR Al Barnes, narrowing the Memphis lead to four points. With just over two minutes to play, Charlotte executed a successful onsides kick as ex-Jets WR George Sauer recovered at the Charlotte 44. With the home crowd cheering wildly, Sherman completed a third down pass to Sauer that moved the ball to the Memphis 40. The Southmen were putting heavy pressure on Sherman, and after a bomb intended for Barnes fell incomplete, a screen pass was intercepted by CB David Thomas at the Memphis 11 with 1:10 remaining to snuff out the home team’s hopes and preserve the 27-23 win for the Southmen. Memphis outgained the Hornets (369 to 211) and in particular outrushed them (242 yards to 69). The Southmen also had the edge in first downs (20 to 15). Charlotte turned the ball over three times, to two suffered by Memphis. Danny White, recovering from the slow start, ended up completing 9 of 18 passes for 127 yards with two touchdowns and an interception. Willie Spencer gained 109 yards on 17 carries and J.J. Jennings had 104 yards, also on 17 attempts. Ed Marshall (pictured at right) caught three passes for 44 yards. For Charlotte, Tom Sherman was successful on 12 of 27 throws for 142 yards and no TDs with two intercepted. Jim Ford was the leading rusher with 49 yards on 17 carries. George Sauer had 5 pass receptions for 57 yards. The Southmen lost only one more game on their way to a league-best 17-3 record, putting them atop the Central Division. They were upset by the Florida Blazers in their playoff game. Despite the enthusiastic new fan base, Charlotte won only one of its last six contests to end up at 10-10 and second in the Eastern Division. 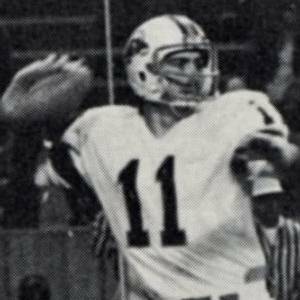 Danny White completed 79 of 155 passes for 1190 yards with 12 touchdowns and 9 interceptions. He also handled the team’s punting, averaging 40.9 yards on 80 kicks. Following the demise of the WFL in 1975, he moved on to the NFL’s Dallas Cowboys for 13 seasons.